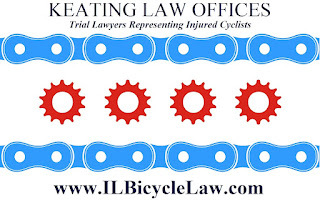 The Illinois Bicycle Lawyers at Keating Law Offices have obtained a $50,000.00 settlement for a Chicago bicyclist who was struck by a car on August 29, 2012 on the North Side of Chicago. This amount represents the full policy limits of the car driver's insurance policy with GEICO. What makes this case most interesting, however, is that GEICO initially denied insurance coverage in this case and refused to offer a single cent to the injured bicyclist for his injuries. This bicycle crash occurred as the bicyclist rode northbound in the designated bike lane on Halsted Street at its intersection with West Chicago Avenue. The collision occurred when the driver of the car failed to stop at the red light and illegally entered the intersection of Chicago Avenue and Halsted Street and struck the bicyclist who had just entered the intersection after his traffic light turned green. What may seem like a "simple case" got complicated when the driver of the car misrepresented the facts to GEICO. The driver told GEICO that he did nothing wrong and the bicyclist entered the intersection on a red light. The driver also claimed that no police report was ever completed by the Chicago Police Department. Based on the driver's assertions, GEICO denied the claim and refused to provide insurance coverage for the collision. Unbeknownst to the driver and GEICO, the injured bicyclist had already retained attorney Mike Keating to represent him. Attorney Keating knew the bicyclist from Chicago's bicycling community and trusted his version of events 100%. Keating Law Offices obtained 1) the police report; 2) the ambulance report; 3) video from the overhead blue light cameras; and 4) recordings of all the 911 calls made about the collision. The driver's memory must have been very short because one of the 911 calls was from HIM. The driver told the 911 operator in a call on the recordings the law firm obtained that, “I just ran into a biker on Chicago and Halsted… I need an ambulance at Chicago and Halsted. I just struck a biker. I was driving a car." The other 911 calls corraborated the bicyclist's story that the car, not the bicycle, was the vehicle in the intersection on a red light. Moreover, the responding Chicago Police officer listed the driver as "Unit 1" on the official Illinois Traffic Crash Report, the very police report GEICO claimed didn't exist. The determination of the driver as "Unit 1" reflects that the responding officer assessed the car driver as the person at fault for the collision. This overwhelming evidence in favor of the injured bicyclist was forceful in showing GEICO that its insured violated several provisions of the Illinois Vehicle Code in causing this collision. 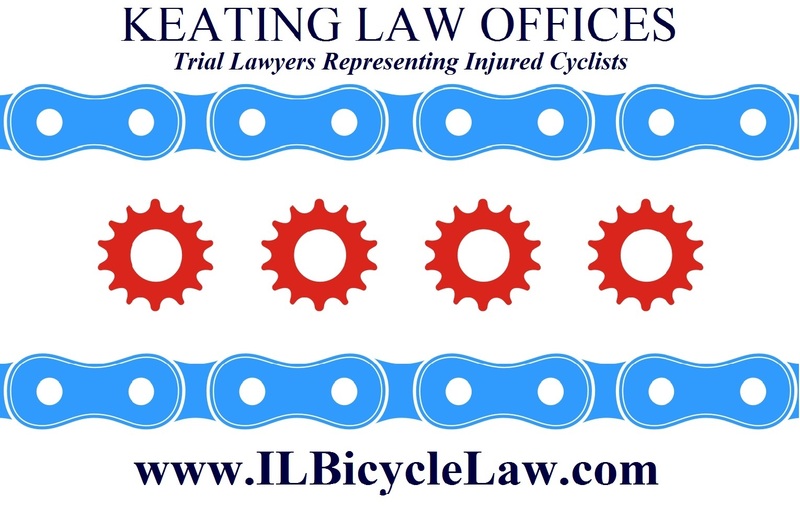 Section 1003.1 of the Illinois Vehicle Code requires that drivers of vehicles exercise due care to avoid colliding with any person operating abicycle. (625 ILCS 5/11-1003.1) The driver also violated Section 11-306 of the Illinois Vehicle Code which states that vehicles must stop prior to entering theintersection when the traffic light is red. (625ILCS 5/11-306). The bicyclist was taken via ambulance to the emergency room at Northwestern Memorial Hospital. After undergoing a physical examination and several x-rays, the physicians determined that he suffered fractures of his tibia and fibula near his ankle.The bicyclist also sustained multiple lacerations and bad road rash along the right side of his face. Fortunately, even though the bicyclist had to undergo physical therapy and some painful weeks, he was able to avoid surgery and get back to riding as soon as possible. In the end the case settled for the full amount of the $50,000.00 GEICO insurance policy.